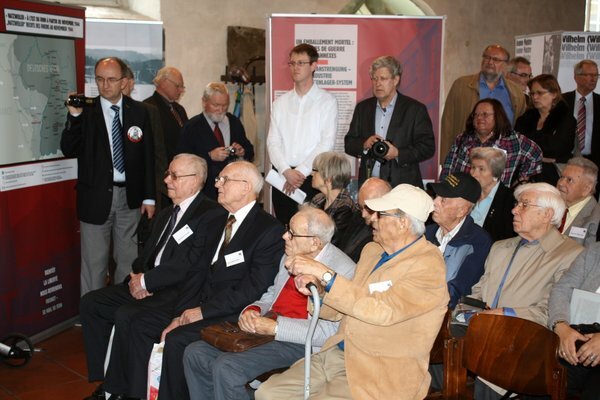 Meeting with survivors in April 2015 – KZ-Gedenkstätte Vaihingen/Enz e. V.
In 2015 the 70th anniversary of the liberation of the Vaihingen concentration camp and the end of the Second World War was probably the last opportunity to invite survivors of the camp as guests to Vaihingen. By way of preparation the addresses of 30 former inmates of the camp who were still alive were found. The City of Vaihingen/Enz represented by Mayor Gerd Maisch immediately agreed, together with the Memorial Foundation, to extend invitations to them and put together a programme for April 2015. The date agreed upon was the 7th April – the date of the liberation. 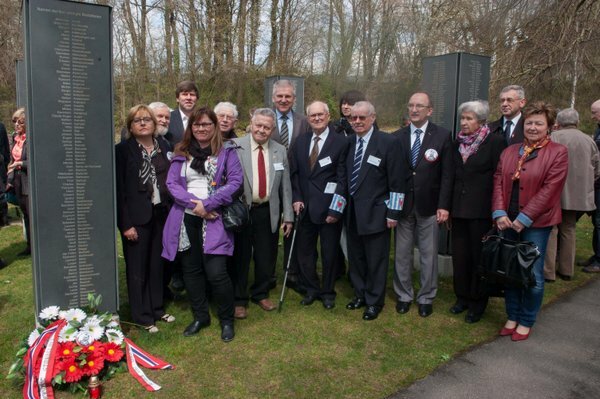 In the event 8 survivors with their relatives as well as relatives whose father, grandfather or husband had previously died or had died in the camp came to Vaihingen between 9th and 12th April 2015. 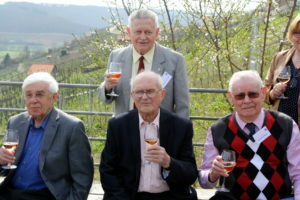 From Poland came Boleslaw Urbanski, Jerzy Wojciewski and Eugeniusz Dabrowski, all three of whom live in Warsaw as of 2015. Isaak Akerman, who was born in Danzig, and his wife Rachel came over from Haifa in Israel. 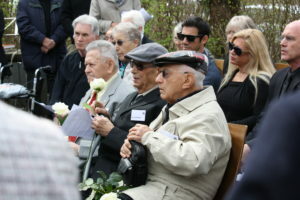 94 year old Jules Schelvis, who as of 2015 lives in Amstelveen and who has been closely connected with the memorial for many years and has visited a number of times, came to Vaihingen to commemorate the anniversary. 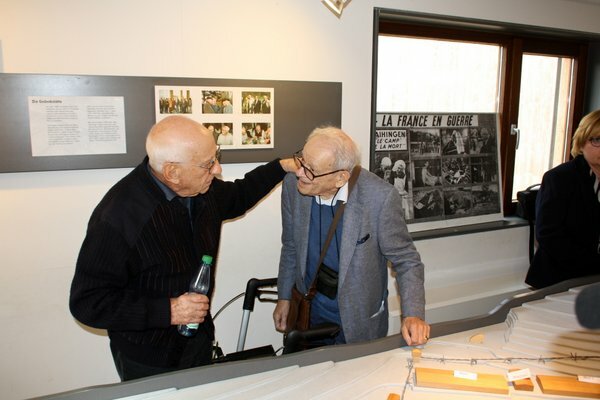 Together with their relatives Manny Steinberg, Benjamin Zysman and Ted Weisbord flew in from the U.S.A. to visit the scene of their terrible suffering. 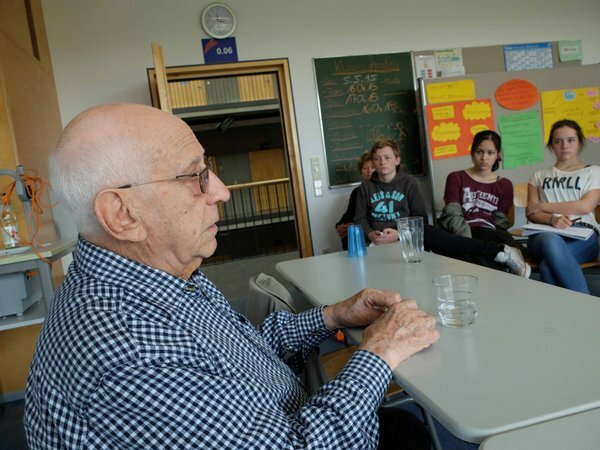 On Friday 10th April for about 90 minutes the 8 survivors answered the questions of around 70 students of the Stromberg and Friedrich Abel Grammar Schools in Vaihingen/Enz. The motivated and well-informed pupils, who had either worked on two theatre projects dealing with the topic or had made use of the unique opportunity to participate in an “alternative” history lesson during the holidays, were deeply impressed by the reports of the former inmates. The pupils were surprised and moved above all by the warm-heartedness and openness they were shown both by the victims and their families. Asked how he had managed to survive, Benjamin Zysman explained that it was the need to report to posterity the enormity of what had happened. The significance and warm atmosphere of the meeting, which falls back on a long tradition, became especially apparent on 11th April 2015 during the official welcome ceremony in the Löwensaal of the City Assembly Hall. 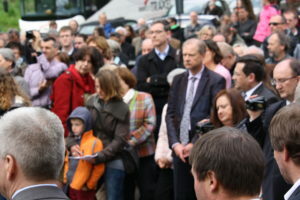 In a very personal speech, survivor Isaak Akermann stressed how important the visit was for the survivors themselves and referred to the respect in which he holds both the long-lasting hospitality of the City of Vaihingen/Enz and above all the dedication and work of the members of the memorial team. In an emotional speech Ms. Wendelgard von Staden focussed on the fact that her generation had built up a different Germany, that soon there would be no more survivors and witnesses to tell their story first-hand and that therefore this meeting was unique and would probably be the last of its kind. She thanked the survivors for not having rejecting the efforts of the City and the Memorial Foundation at reconciliation and for having the courage to accept the invitation. 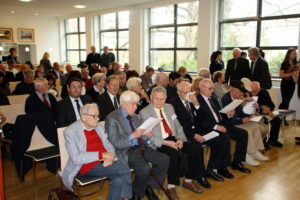 The real climax of the visit was, however, undoubtedly the memorial commemoration at the cemetery of honour of the former concentration camp which took place on Sunday, 12th April at 11 a.m. Through attending this hour-long and dignified commemoration the 300 participants sent out a clear signal for tolerance and human dignity. 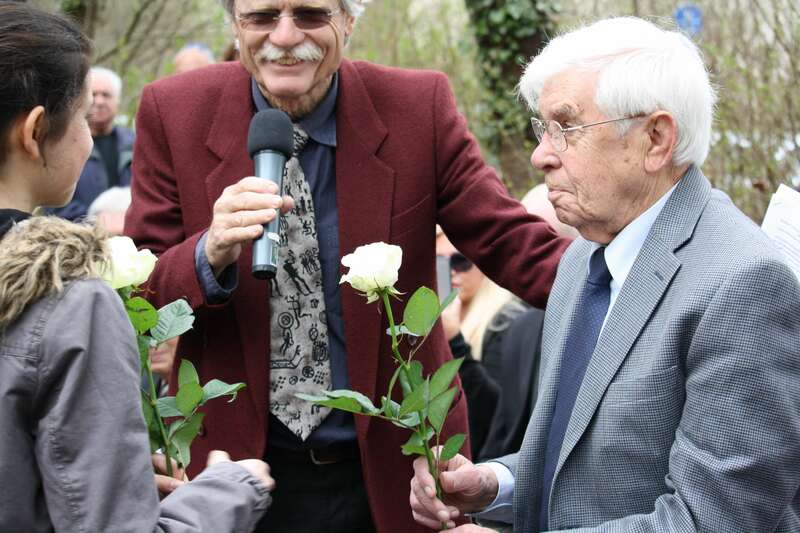 They had come to remember the 1700 victims of Vaihingen concentration camp and the unimaginable suffering that the Nazis had subjected them to. For the 8 survivors and their families present as well as the relatives of other former inmates who had travelled specially from Poland, the U.S.A. Norway and Germany this great response and the efforts of the Vaihingen/Enz Memorial Foundation was an important confirmation that the events that took place at Vaihingen concentration camp and its victims would not be forgotten and that there would be no end to the historical treatment and investigation into the inconceivable deeds and actions of those days. About 300 citizens participated in the ceremony. After this, the participants commemorated the victims in their different ways: through Christian prayer; the Jewish Kaddish was spoken by survivor Benjamin Zysman from the U.S.A.; while roses were placed in silent remembrance on the graves. 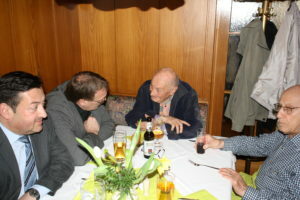 deepened the relations and friendship and formed the basis for the frank and cordial atmosphere of the whole event. Mainly responsible for its success were the participation of Mayor Maisch and the excellent organisation by the Vaihingen/Enz press officer, Ms. Fischer, and her team.